The contactor in your a/c connects and disconnects power when commanded by the furnace and thermostat. "Why Is My A/C Not Running?" This is a very popular question I get every year as summer rolls in. 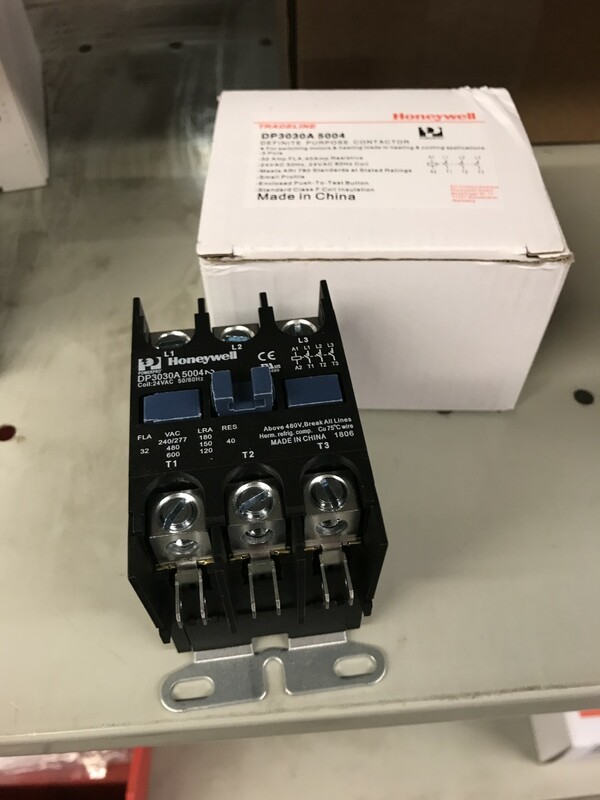 While there are a multitude of possibilities (capacitor, motor, circuit boards, etc...), the focus of this article will be on the contactor. 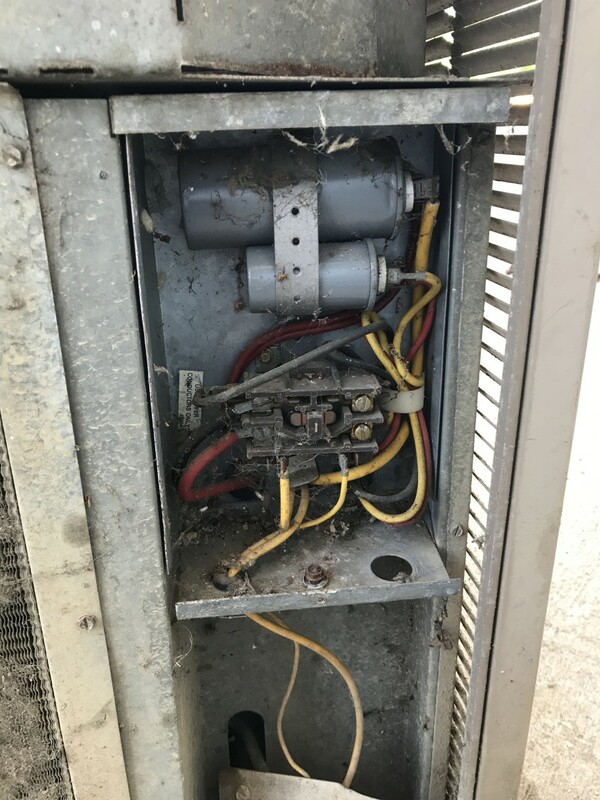 While the capacitor and fuses (which I've written about and talk about with folks regularly) are primary suspects in a/c breakdown cases, the contactor is another pretty common air conditioning part failure that is pretty simple in both its function and repair. Let's take a look at the capacitor and what it does, how it works, and how to repair or replace one. 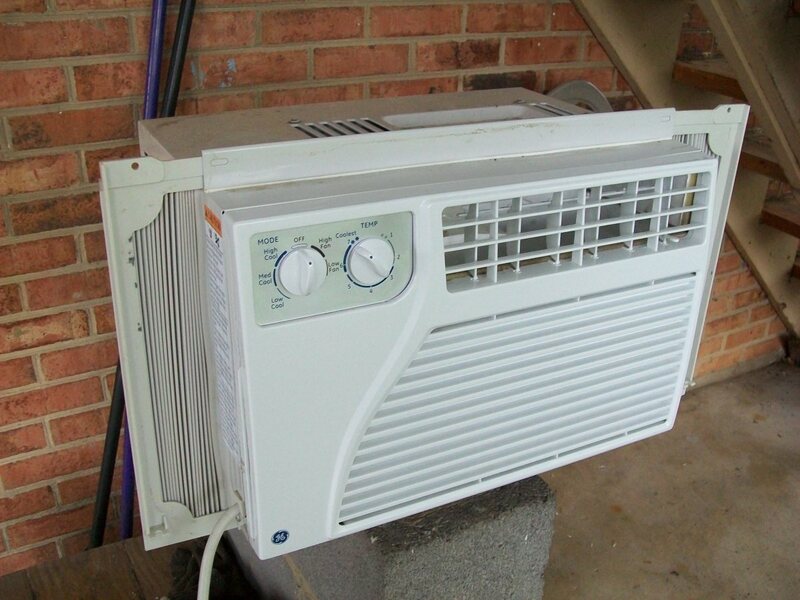 How much do you already know about your a/c unit? I am the master of all things HVAC. 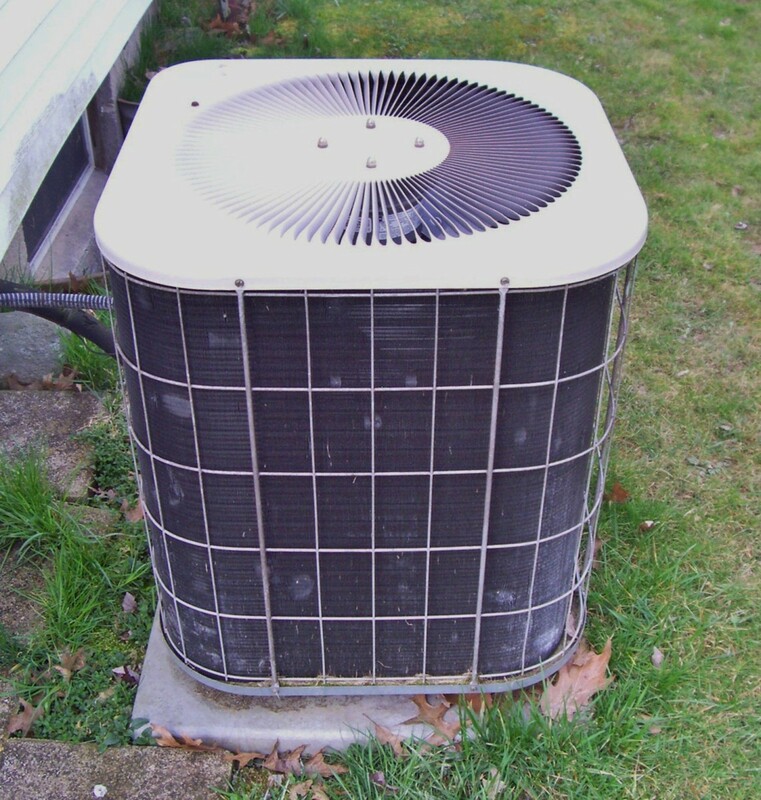 What Does the Contactor on an Air Conditioner Do? The contactor on your a/c unit is basically a switch that allows or prevents power to the unit. 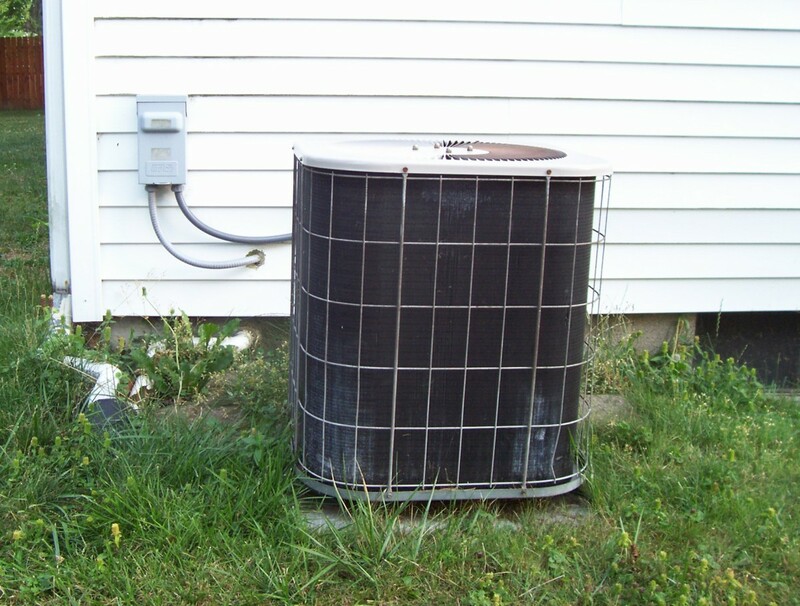 While there is always power at the unit (assuming everything else is working properly), it sits at the contactor waiting to pass through to the functioning parts of the condenser like the motor and compressor. Like all switches, the contactor is like a drawbridge...nothing can pass until the bridge is closed. Of course, you don't have to go out and flip this switch to make the unit come on like you do a light, but nonetheless, it's a switch, just a fancier version of one. So how does the switch get "flipped"? Let's dive a little deeper into how the contactor works. Close up view of the contactor's 24v coil. How Does an A/C Contactor Work? Now that we know it's a switch the question becomes: "How does it get turned on?" While light switches need you to physically flip the switch and pressure switches use air to operate, your contactor is triggered by a solenoid pulling on a small plunger (the button). If you look here in the picture I've provided above, you'll see the coil windings in the part that is simply referred to as the "coil." When 24v hits this coil, it generates just enough force to pull down that button on top of the contactor. When pulled down, that button is the "drawbridge" closing and allowing electricity to pass through and run the condenser fan and compressor. 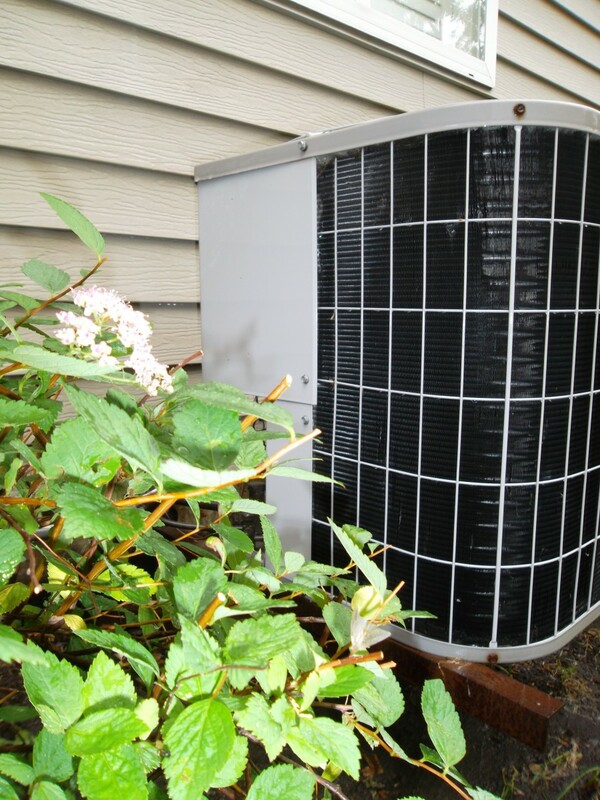 To give you a more complete description, here is the step-by-step of an air conditioning cycle up to this point. The thermostat senses it's warmer than the temperature it is set at. As the temperature rises, so does the little switch inside the stat making the proper 24v connection to the furnace control board that tells it to turn on the fan. At the same time, the furnace relays that message through a 24v signal to the 24v coil in the contactor. That coil energizes and pulls down the button (plunger) on the contactor. Once contact is made on both sides of the contactor, power can then pass on to the motor and compressor and provide you cool air. What kind of contactor do I need? Nearly every residential condenser (outdoor part of your a/c system) uses a 208/230v, double pole contactor with a 24v coil. When talking about contactors in HVAC equipment there are usually three different kinds. Single pole, double pole, and 3 pole. They are typically rated for 120, 208/230, and 460 voltages, while the coil voltage can vary. 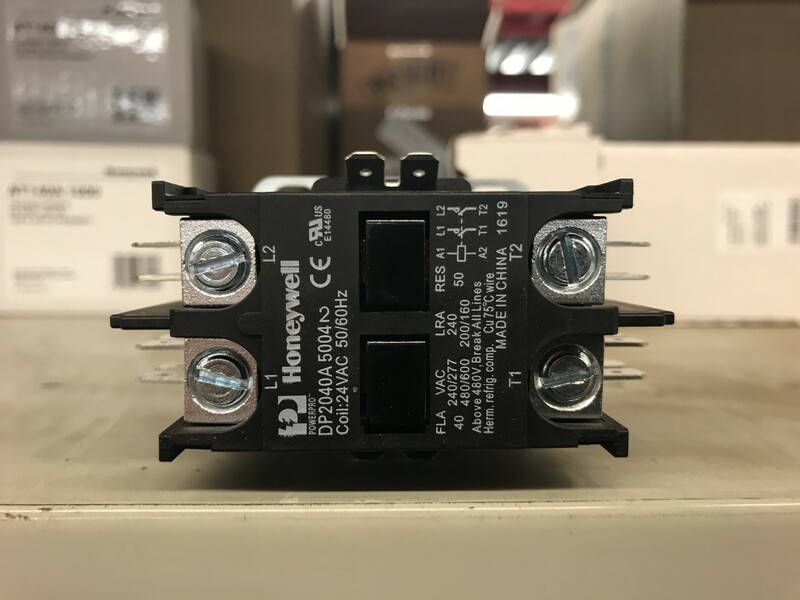 I've already mentioned that most residential systems use a 24v coil to trigger the contact, however, those coils can sometimes need 120v to operate some of the larger contactors. Most of these higher rated contactors are only found in commercial environments, however, and not likely to be of concern to most homeowners. A single pole contactor only has to connect one wire for power. The other leg is just the neutral/common and is always in the circuit. On this part, the plunger is under the cover you see here. A double pole contactor has to connect two power wires and is typically used in 208/230 volt circuits. This is the most common a/c contactor. 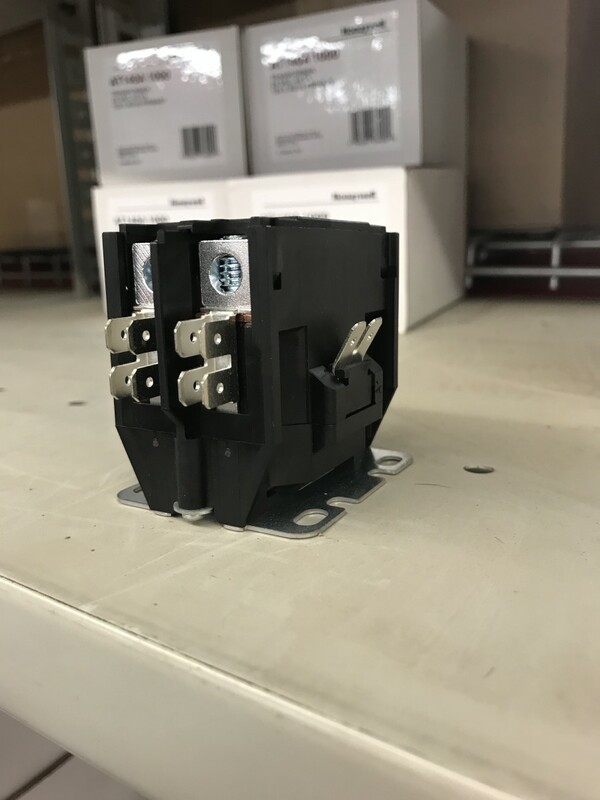 Your 3 pole contactor has to connect 3 power wires for use in 460v, 3 phase circuits. These are normally only found in commercial equipment and buildings. Here you can see the plungers. There is one for each leg of power. Chattering: Dirty contacts or a weak coil can cause the plunger to "chatter," meaning it's trying to make contact but cannot fully engage. Thus it "chatters." Humming, but no power: You may hear a hum noise coming from the coil, but the button is not being pulled in to make contact. If you push the button in with a stick and it works, this may tell you the coil is bad or the contacts are dirty. Melting: In drastic cases, you may see the plastic molding/casing on your contactor melted. This is a sure sign that it needs to be replaced. Coils can be replaced but are not repairable. 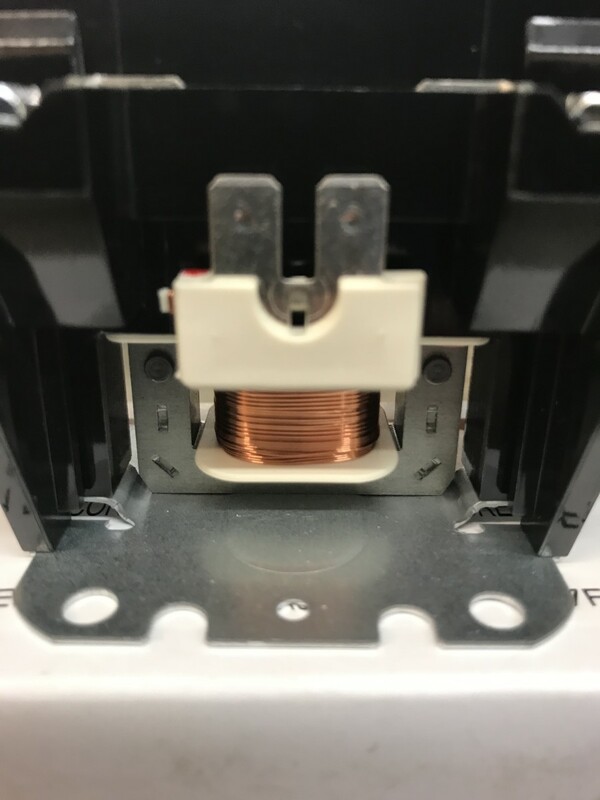 While the coil in a contactor can be replaced, it is usually not worth the effort. They can often be hard to find to fit the contactor you have. 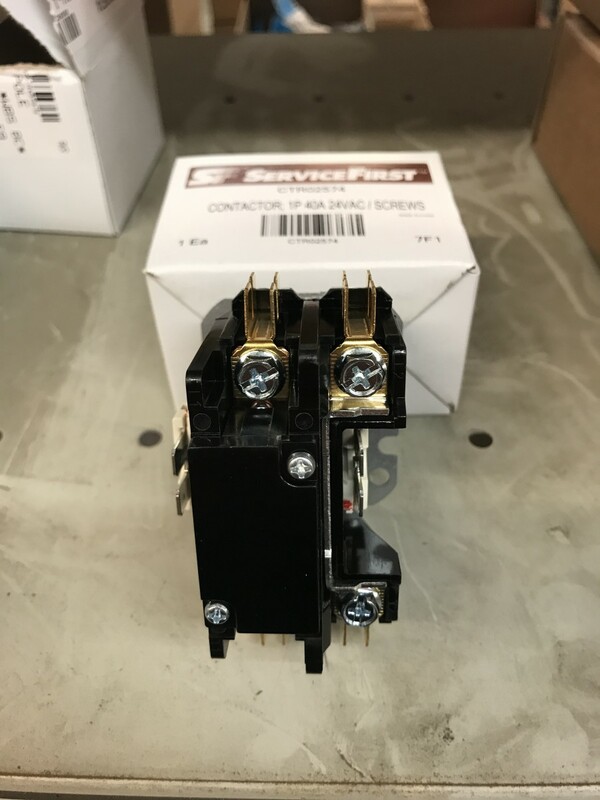 It takes more effort to take the contactor off the unit then dismantle the coil than it does to simply replace the contactor. Contactors for residential units are typically rather cheap...somewhere in the $20-$30 range. The points of contact on the contactor can sometimes become dirty/charred/corroded. These are cleanable with some contact cleaner. You really don't need to soak it down too heavily, as the contact points are rather small and do not require much to clean. In this case, there is no repair that can be made and replacing the part is the only option. Be sure to check the ratings on your part and replace it with one of the same specifications. I know I've suggested that most units are the same, but that does not mean you shouldn't check yours to be sure. The only tools you will likely need is a Phillips or flathead screwdriver and perhaps a quarter-inch nut driver to replace the part with. All you do after the power is off is disconnect the wires from the contactor and unscrew the feet from the unit. Then screw the feet on the new part back on the unit and reconnect the wires. You're done. WARNING: No repairs to your contactor should be made without turning off or disconnecting the power to the unit. I recommend you shut down the breaker to the furnace, pull the disconnect or shut down the breaker to the a/c, and confirm there is no voltage to the furnace with a reliable non-contact a/c voltage detector. 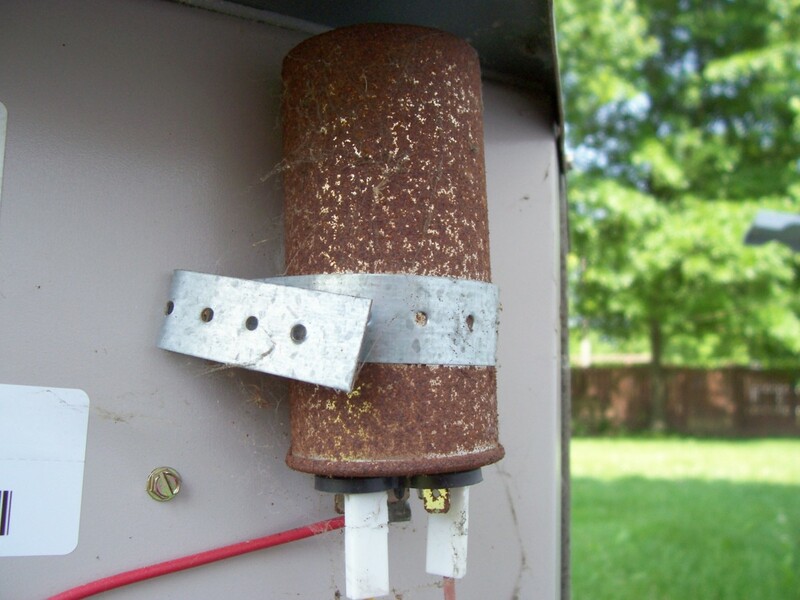 If you are not confident in your electrical safety knowledge, then you should call an HVAC technician to make this repair, as it can be very dangerous. What's a non-contact voltage detector you ask? This is the one I use. It's reliable, works well, and it's pretty inexpensive. Just probe around inside the furnance after cutting the power to the unit and it will set off a warning beep (and light up) if it detects a/c voltage still present in the unit. This little guy has saved my rear end more than once. You see here there are a couple of low voltage wires that pull off and the higher voltage that are screwed down, while in the background you see the 1/4" screws that hold the part in place. A very easy job, thank goodness, because this one has to go. 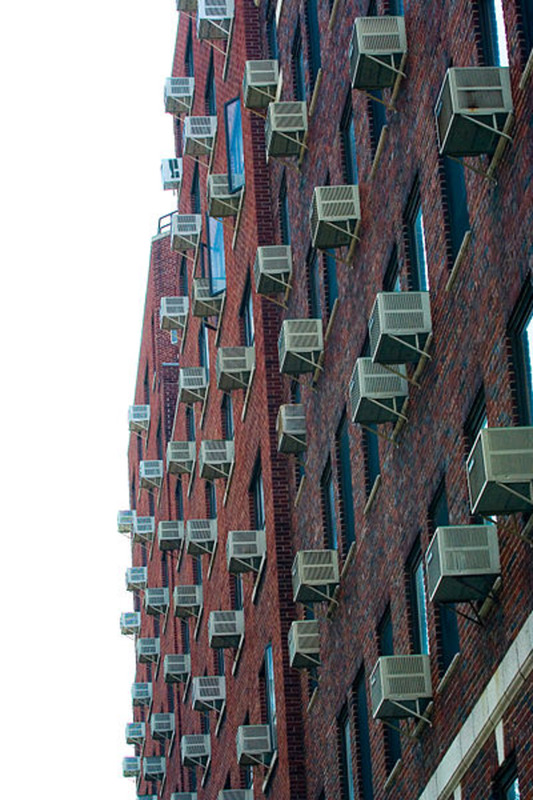 If figuring out what was wrong with our air conditioners was easy, then we wouldn't have need for all the HVAC companies we have out there. But sometimes the fix is something we can handle ourselves. I hope the information I've provided for you here has helped determine if your a/c breakdown was a result of a contactor or at least helped to rule it out as the culprit. If not, perhaps reading some of my other HVAC articles can help you in your continued search for the problem and help you and yours to stay cool this summer. My outdoor unit hums when I turn on, the fan doesn't spin, then it stops after a few seconds. I replaced the capacitor, still nothing. Could my AC problems be the contactor? It sounds like it could be. I can’t say for sure without being there but it’s not an expensive part to try if you’re comfortable with doing the repair. I replaced the furnace circuit board, the contactor, and run capacitor and my AC unit still doesn't work. I've also replaced the thermistat. What else can I do? Consider the following troubleshooting questions: Is the low voltage wiring intact? Are the fuses blown? Breaker tripped? There are a lot of possibilities here. Hi Eugene - The contactor's life span can greatly depend on the region the unit is in. In general, contactors aren't the most common failure and mine for instance has never had an issue in 13 years. However if I move my unit to Arizona, consistently high temperatures and dustier conditions could wear one down much faster. Generally how long do these contactors last in terms of switching cycles? Presumably if the hysteresis band in the thermostat is greater, there's less switching so they last longer?